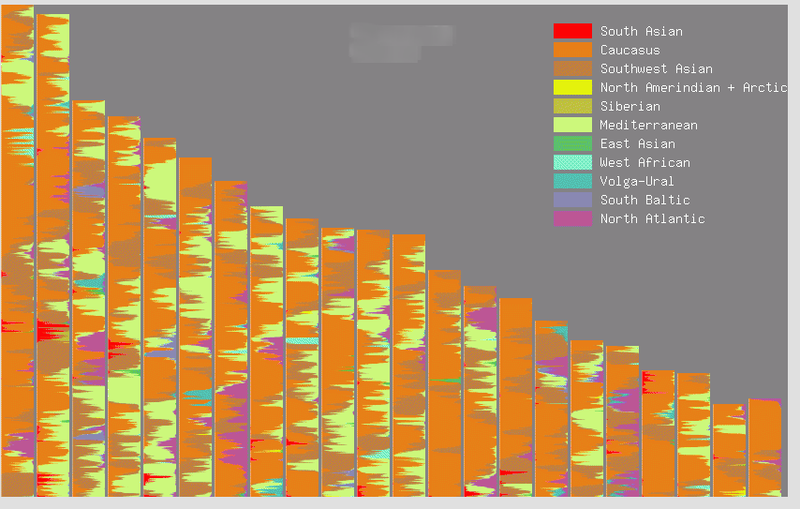 Here is an example of Chromosome Painting with my Grandmother's DNA using Eurogenes K11 at Gedmatch. 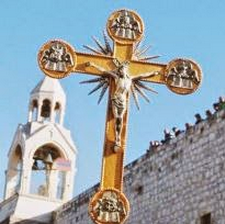 I think it is pretty representative of most Palestinian Christians. 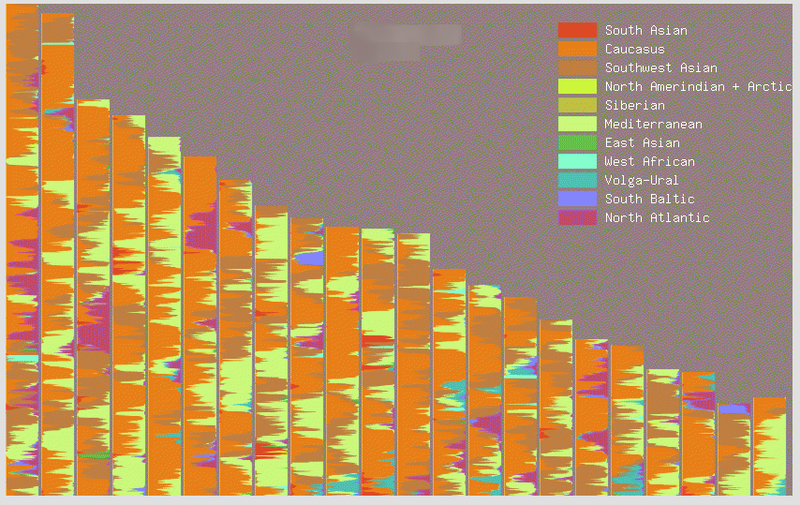 You can see the dominant Caucasus color with other ancestry mixed in. You can also see here the strong Mediterranean genes left by the Greeks and Romans! Clearly the Southwest Asian (Arab)and North Atlantic European genes are evident. 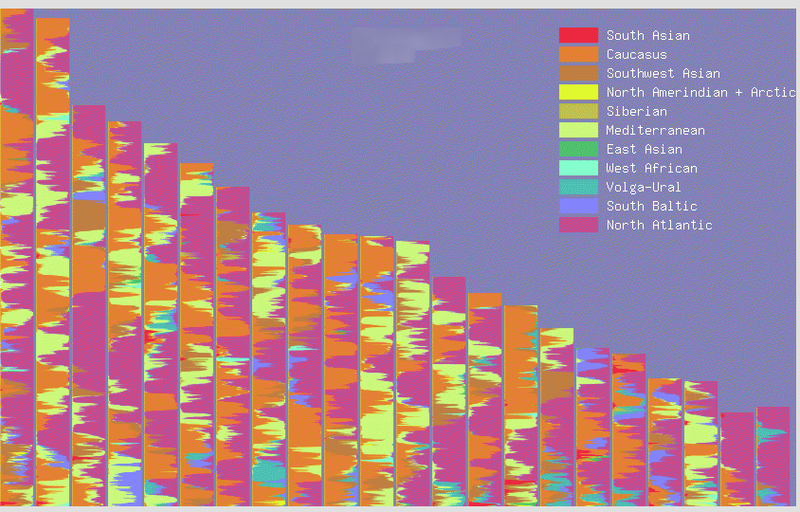 Still the overriding ancestry is Caucasus, which represents native roots in the Levant. It's pretty amazing to see it in color. Here is my Grandfather's results with the same calculator. You will notice minor differences. Does my Grandfather look like he has more admixture than my Grandmother? To me it looks like more Mediterranean and a little more Volga-Ural. To give a last example of someone who is 1/2 Palestinian, my results are below. My other 1/2 is Colonial American (English, Dutch, German, French) and British. Look at all those colors! You can certainly tell it apart from those who are 100% Palestinian.